Andrea Coppick was taken for a ride in a small airplane at the age of 8 and fell in love with flying. Her flying career really “got off the ground” when she graduated from Embry-Riddle Aeronautical University with a Bachelor’s Degree in Aeronautical Science and a minor in Aviation Safety. Since then, her career has spanned 20 years and over 10,000 hours of flight time. For many years, she flew turboprop aircraft for a regional airline in the Pacific Northwest and served as a Captain and Check Pilot. Recently, Andrea was hired as a First Officer for a major air carrier and now flies a Boeing 737. Her routes take her all across the U.S., as well as to Hawaii, Alaska, Canada, and Mexico. In addition to earning her pilot ratings, Andrea has sought to learn about many aspects of the aviation industry. Her quest for knowledge has led her to being a certified Airframe and Powerplant Mechanic. She also holds qualifications to fly helicopters and float planes and has earned many hours of flight experience as a flight instructor in small single- and multi-engine airplanes and float planes. In fact, her unique set of accomplishments makes her one of only a handful of women in the United States to hold such qualifications issued by the FAA (Federal Aviation Administration). Her journey in aviation has been long and rewarding. In gratitude for the help she received along the way, one of Andrea’s proudest accomplishments has been founding the Dare to Dream Scholarship. 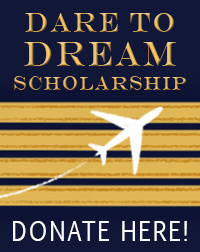 This scholarship is facilitated through Women in Aviation International (WAI) and is just one of many awards given each year by WAI to assist women in the achievement of their aviation goals. 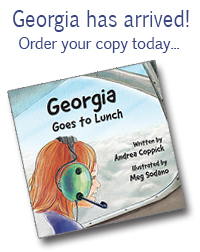 Andrea shares the sense of wonder and adventure in discovering the world of flying in her children’s book, Georgia Goes to Lunch, and seeks to encourage young girls (and boys, too) to consider aviation as a possible and exciting career choice.